Having been guided by the Elven Souls of the Forest Knolls to the Tree Of Life, Forest Boy was able to see the location of the Druid's sacred grove from top the Tree and he received the knowledge from the Tree of what he must do once he confronts the Druid. Forest Boy now arrives at the end of his journey. But it is possibly the most challenging of his trials as Forest Boy must do something that is likely counter to his nature: kill the Druid. Musically, "The Druid of the Wood" contains the same chord structure as "Song of the Druid," but different instrumentation and an additional section at the end. Lyrically, the song repeats the same verses that are in "Song of the Druid" but includes extra verses describing the ritualistic blood sacrifice of the Druid. In "Song of the Druid," which occurred after Forest Boy had ingested some mind altering fungi and was finally able to see the hitherto invisible spirits who had been guiding him through the forest, the Elven Souls sing to him that the Druid of the Wood knows the answer to life; they lay out the conditions under which the Druid's sacred grove should be entered; and they question whether Forest Boy thinks he's up to the task. But in this version of the song, the added verses relay the knowledge Forest Boy received from the Tree Of Life which is that the Druid provides sustenance to all living things in Hobbitozz; the Druid knows he must let his successor take his life since his power has been waning; there is a specific ceremony that must be conducted in order to properly take the Druid's life; and if done accurately the result of the ritual will be that the Druid's spirit will leave his body and enter Forest Boy’s. The violent nature of the lyrics was a rather controversial topic for the members of REPTIEL (which can be seen in the email communications between them during the creation of the album, which were published in Cubby Missalette #22: The Cubby Preachers Missalette). Some members believed the beloved Druid did not deserve such a bloody end, but when it was clarified that the Druid was allowing himself to die so that another could take his place and save the world (similar to the self-sacrifice of Obi-Wan Kenobi in Star Wars: Episode IV – A New Hope), they realized that this was the way the album and the story had to end. It was agreed that in the context of Hobbitozz, the Druid of the Wood is based more on mythological and contemporary fantasy versions of Druids rather than the Druids of history. Though there are similarities between factual and fictional Druids and the Druid presented in Hobbitozz, ultimately the Druid of the Wood is his own entity, serving a different purpose in the Hobbitozz Universe than other Druids of fact or fiction. The Obi-Wan Kenobi comparison is really only half accurate. The self-sacrifice is the same, but the one doing the killing is not. In Star Wars, the evil antagonist Darth Vader kills Obi-Wan, but in this story the benevolent protagonist Forest Boy is the one who must do the deed, perhaps because the Druid of the Wood cannot or should not do it himself. Also there is no antagonist in the story on the level of Darth Vader to commit the act. The story has not been set up that way. The ritualistic aspect of the sacrifice requires that Forest Boy, without waking the Druid, use a piece of sharp deadwood in the shape of a cross (the "holy rood") to pierce the Druid's neck, and drain the Druid of his blood. 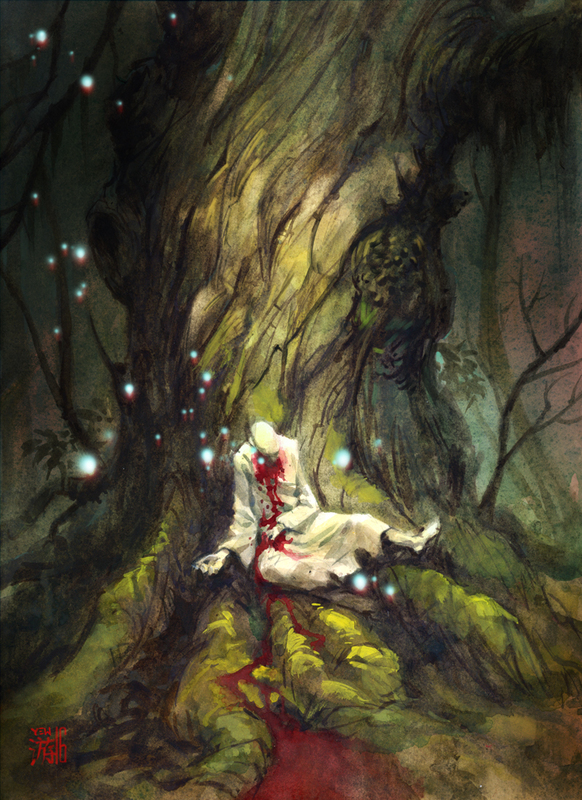 Forest Boy will then see the Druid’s soul exit his body and encircle him before entering his own body. Forest Boy is now the Druid of the Wood for all of time, or until he begins failing the tests that he is put through as the requirement of being the Druid of the Wood. The end of this story is really only the beginning. The tests that Forest Boy, now the Druid of the Wood, must endure begin immediately. An entity known as the Spirit Usher comes to Hobbitozz and takes the new Druid’s spirit through spacetime to the planet Progkp. What happens next will unfold in REPTIEL’s next album (The Planet of) Progkp.